Key Concept #1: Identify the Bronsted Acids: The first concept we have to keep in mind is there are two kinds of molecules, proton acceptors and proton donors. Acids are considered proton donors. That means they have to give up a proton to another molecule. Bases are therefore proton acceptors, meaning they have to accept a proton from another molecule, this requires at least a lone pair of electrons and usually a negative charge on the atom. Let’s look at the reaction above. If we dissolve HCl gas into water, then the water becomes the Bronsted base because it accept the proton from HCl. Since HCl is a strong acid, we know that this reaction far to the right. Key Concept #2 – Determine [H3O+] in solution to measure acidity: As we dissolve Bronsted acids and bases into solution, the concentration of H3O+ in solution will change. Remember though, that concentrations are in units of moles (M) and have a wide range of concentrations in solution (typically 10+1 to 10-15 M). Since it is clumsy to use such large numbers, we transform this concentration into powers (the p in pH) of the concentration of H3O+ (the H in pH) in the equation below. 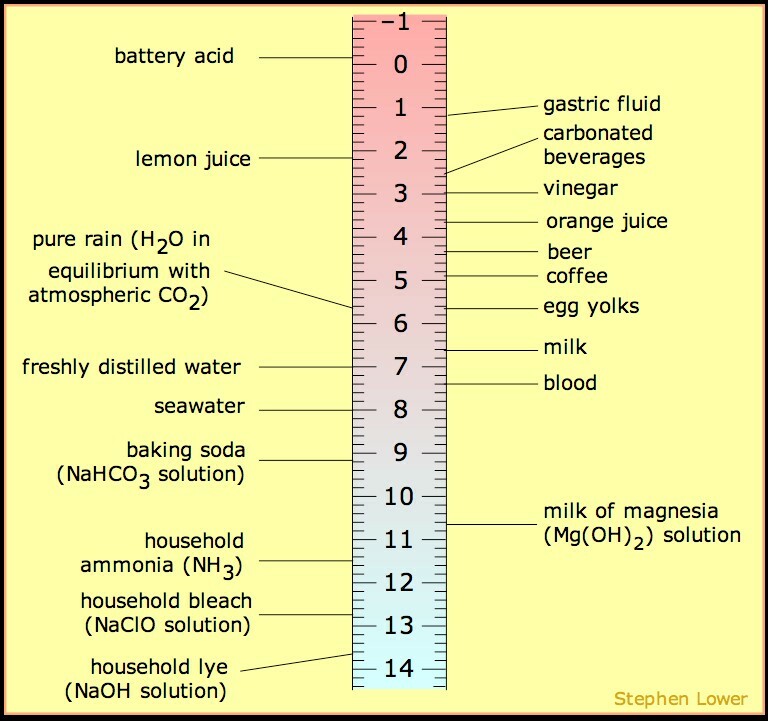 Now, let’s take a look the pH of some household items to relate what pH really means. Milk has a pH of 6.7. If we solve for [H3O+] in the equation above, we find this is 2×10-7M or 0.2mM. This is very similar to water (pH=7) which is 1×10-7M or 0.1mM, so not very acidic. Coca-Colaâ has a pH of 2.5, solving for [H3O+] we find the concentration of proton is 3.1×10-3M or 3,100.2mM or more appropriately denoted 3.1mM. This tells us there is 15,000 times more acid in cola than milk or water. So, it is important to keep in mind the change of pH by 1 unit equals 10-fold change in [H3O+]. There are even more dramatic changes in pH between household items that can help you to appreciate the relationship between pH and [H3O+] in the chart below. Key Concept #3 – Predicting the equilibrium of the reaction: The numerical value associated with acidity is known as pKa, which is the equilibrium concentration of the acid and conjugate base. The higher the value, the more acidic the solution. There are two key tips in predicting acidity; 1) equilibrium lies towards the weaker acid (a low pKa towards a higher pKa) and 2) equilibrium lies towards the most stable conjugate base. Lets take a look at the following reaction. If we know the pKa values of the acid and conjugate acid, we can easily see that acetic acid (pKa = 4.75) reacted with sodium hydroxide produces the conjugate acid water (pKa = 15.7). Equilibrium will therefore shift to the right. Atom which has the charge—For elements in the same row of the periodic table, electronegativity is the dominant effect. For elements in the same column, size is the dominant effect. Resonance—a negative charge is stabilized by resonance. Induction—electron-withdrawing groups, such as halogens, stabilize a nearby negative charge via induction. Orbital—a negative charge in a sp-hybridized orbital will be closer to the nucleus and more stable than a negative charge in an sp3-hybridized orbital. 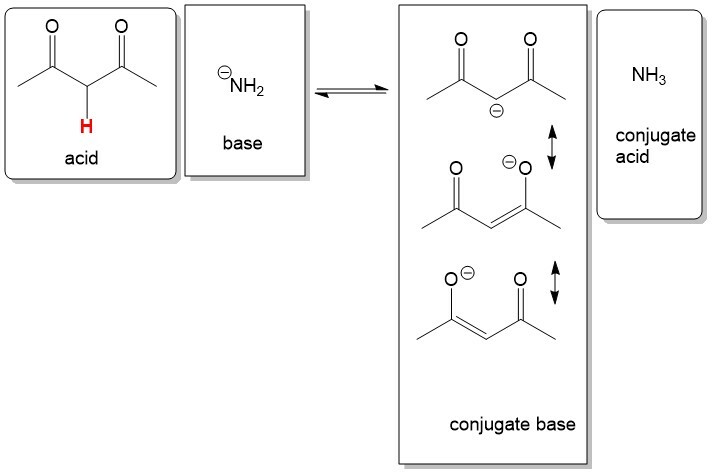 sp-2 hybridization of the conjugate base. For these reasons, we would predict the equilibrium to the right. We in fact are correct since pKa of the acid, pentanedione, is 9 and the conjugate acid, ammonia, is 38. Therefore, this reaction is 10^29 fold (i.e. pKa 38 – pKa 9) towards the right! Sign up today with StudyOrgo to get more great tips on all of your organic chemistry reaction questions!